Fairy Doors - Do you believe? Bring a little magic into your garden with some clever and unique fairy doors! We've tucked a few fairy portals throughout the herb gardens, waiting to be discovered by the fairies and those who believe. Tucked in among the ivy, isn't this just the perfect spot for this ceramic door? This little handcrafted door needs to be protected from the elements, so it's nestled back in this concrete perch among the flower pots. An old tree stump provides the perfect spot for a small fairy door, one of our newest acquisitions. Old tree bark provides a rooftop and a walkway to the fairy door. If you build it, they will come! Look closely and another fairy door can be discovered in the children's corner of the gardens. This whimsical portal is affixed to the play fort. Did you know that only faerie magic can open a faerie door? Here the faerie's will have a helping hand with the many kids that entertain themselves in the play fort. Can you spot the fairy door nestled among the ivy and branches of this old evergreen? Look closely! At the Spoutwood Farm Fairy Festival, we moved into "Rainbow Court" a new booth location for us and our fellow vendors welcomed us to the neighborhood with these fairy cakes! Six cupcakes each a different flavor, all labeled with the cute little flags, and each decorated so uniquely. True fairy cakes with mushrooms, flowers, butterflies, dragonflies and little touches of glitter. While it was difficult to eat them -- we did and they tasted as yummy as they looked. so that we may enjoy our freedom. On our recent Rosemary House bus trip we visited the Inn at Fernbrook Farms, for our evening meal. When we first arrived we loaded up on the farm wagon for a tour of this amazing enterprise. It is an Inn, a full scale garden nursery, a tree farm, a CSA, the gardens are a wedding venue, a farm stand shop, an environmental camp for inner city kids and much more. A little sampling from the farm shop which also featured Jersey products. Our evening meal was served buffet style and then we could eat anywhere in the Inn. Dinner featured an abundance of well seasoned home cooked options. You could select chicken with roasted potatoes. Or perhaps the Vegetarian quiche with farm fresh eggs, lavishly sprinkled with parsley. Local, organic and Jersey fresh produce for our salad complete with colorful edible flowers. And a beautiful tray full of steamed asparagus, onions and sun dried tomatoes. All topped off with a Lemon Chiffon Cake that was too delicious to take time to snap a photo! Even after Susanna caught on to the 'just a taste' request and the 'let me lick the drips' scheme, the ice cream woes continued. While the older sisters were all away at college, and the youngest was home alone with mom and dad, they would each have their own carton of ice cream in the freezer, back in the day when a half gallon was really a full half gallon! Mom would choose black cherry, dad favored rum raisin, and Susanna would select chocolate marshmallow. Can you guess which one was enjoyed by the sisters when they came home for the weekend!? Part of the fun at the Grounds for Sculpture Museum was the interactive displays. Sculptor Seward Johnson does a lot of "celebrating the everyday" in his sculptures. This table scape is a sculpture that we enjoyed. We let our imagination run on what we were going to dine on that evening, how good the wine tasted, what lake we were sitting by and our plans for tomorrow as we pretend to be "ladies of leisure". Real? or Sculpture? Enjoying the sun while we discussed the medicinal herbs class we are taking. There were so many everyday sculptures, like children eating ice cream or a police officer writing a parking ticket, two women on a park bench or a lady arm raised for the bus that you began to think everything was a sculpture like the painter or gardener -- but then they would move! The Grounds for Sculpture Museum in New Jersey features 42 acres of beautifully landscaped grounds to stroll and enjoy a variety of sculptures. We were there recently on a Rosemary House Traveling Herb Seminar. In 1993, Seward Johnson created the Grounds for Sculpture on the old NJ Fairgrounds. We were there for the Seward Johnson Retrospective exhibit which presents an overview of the popular sculptor's 50-year career through a lifetime collection of his works. This very special exhibit has been so well received it was held over for another season. Some of his series is "Celebrating the Everyday" and features normal scenes. One of the shows most exciting pieces is The Awakening, a 70-foot long giant emerging from the earth whose 17-foot arm extends dramatically into the sky. 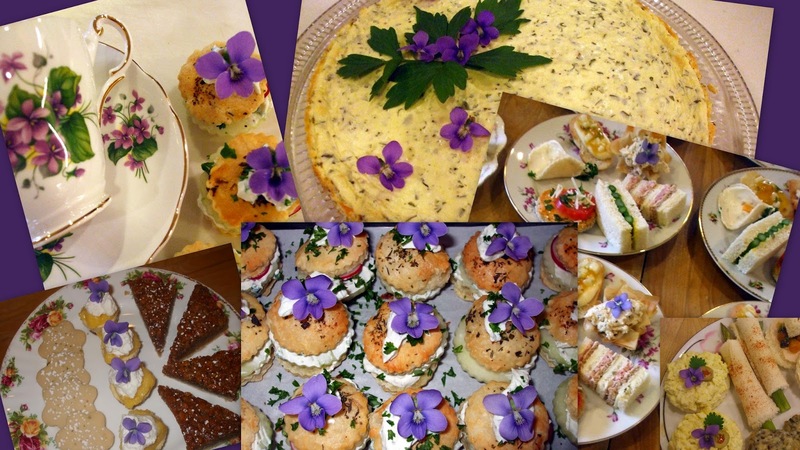 We love the abundance of spring flowers in the garden and we love to use edible flowers in the tea room. It makes an ordinary dish extraordinary and offers a great element of both surprise and delight. Tulips make the most wonderful bowls for Chicken Salad or Egg Salad. We pull out the pithy center not because it isn't edible but because it is too chewy. Violets can be used to make jelly or syrup and are actually quite nutritious. Sometimes we float one in the water glasses. Or top a tartlet with one. We love the contrast in color with the purple violet against golden yellow lemon curd. Lilacs are a mouthful of flower so we often pull them apart and use the petals in a tossed salad for a little extra pizazz. Little grape hyacinths are harbingers of spring and are here and gone before you know it but not before we can use those tiny flowers in some rice for just a touch of color. 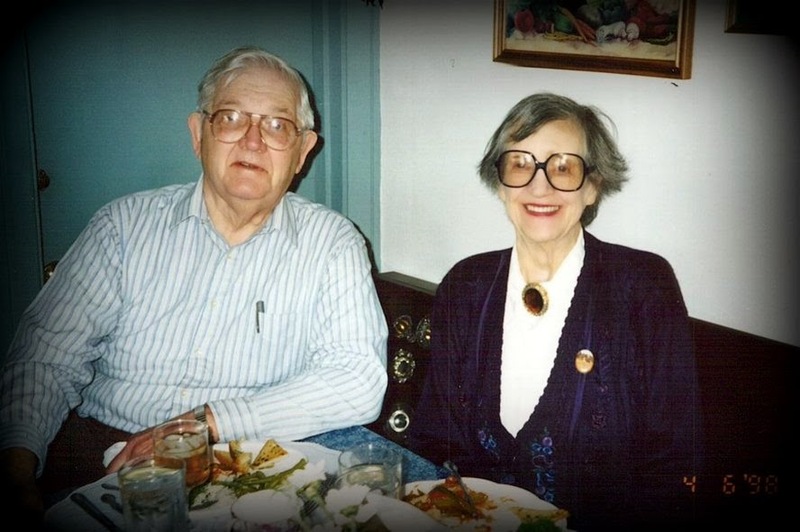 Our parents, Bertha Ottylie Peplau and Byron Leibold Reppert, were united in marriage on this day, 70 years ago. Mom married a proud Marine at a very simple ceremony in Reading, PA as the war was winding down. There was no fancy wedding gown or elaborate cake. Over the years, they were blessed with four daughters and celebrated 54 years of wedded bliss together. Each brought their strengths and weaknesses to the union, but their love for each other and their girls was evident with their mutual respect and their devotion to family. Happy Anniversary, Mom and Dad! We love you, and miss you. Note: This photo was taken in the tea room in 1998. We celebrated Mother's Day in the tea room this weekend with Afternoon Tea at 1:00 on Saturday and again on Sunday. With the tables decorated mostly in pink, and a little gift for everyone (Artisan chocolates and a tea time charm), the scene was set for an extra special day. Happily growing in the kitchen garden right now is Salad Burnet (Sanguisorba minor). This unique plant with its compound leaflets that form a rosette crown mimics the taste of cucumber in the garden. Known as the 'dyspeptic's cucumber', it has all the flavor and none of the effects. The crisp leaves are undaunted by weather, and even in the dead of winter, you can harvest this evergreen herb. Many culinary uses for this perennial herb abound. You can harvest the leaves for salad, dips, or herb butters. It's also flavorful in vinegars. Simply remove the leaves from the stem and toss into a cucumber for a fresh summertime flavor. In the language of flowers, it is referred to as 'the merry herb', it 'doth comfort and rejoice the hart'. We served these cucumber sandwiches recently in the tea room. Soften the cream cheese with the mayonnaise. Add the herbs and seasonings. Mix thoroughly. Spread on round slices of bread. Top with a thinly slice cucumber, a dollop of the cream cheese mix and garnish with a fresh burnet leaf. There are many reasons why this is one of our favorite times of the year, but in particular, we are most happy to see the early spring violets open with the warmth of the sun. In the tea room, we love to garnish with them as they add such a pop of color and delight to whatever tea time treat they are gracing. Most tea room guests will first ask 'are they edible' before wholeheartedly chomping down on the violet while a few others will timidly nibble on a petal and there are always a few that will carefully pluck the flower from the food and gently set it aside on the plate. Where do you stand on sampling fresh edible flowers? Every year we look forward to participating in the Spoutwood Farm Faerie Festival in Glen Rock, PA. This year it is May 1st - 3rd. We are the herb plant vendor there and it is such fun to see who will wander into or past our booth. This is our friend Jenni Buffington of Jenni Buffington Art. She is a favorite vendor at our own Fairy Festival here at The Rosemary House every September, the first weekend after Labor Day. The Blessed Order of the Green Man comes through offering the blessings of spring. The creativity of the wings and the costuming is always so much fun to enjoy. The leader of the Woodland Tribe looking for shade plants. All ages have fun at the Faerie Festival. 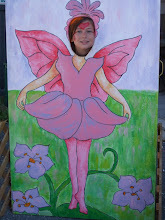 Our Fairy Festival is geared towards children. We leave with a few less plants and Fairy inspired! If you make it to the Spoutwood Fairie Festival, be sure to stop by and say 'hi' to Susanna and Marj.